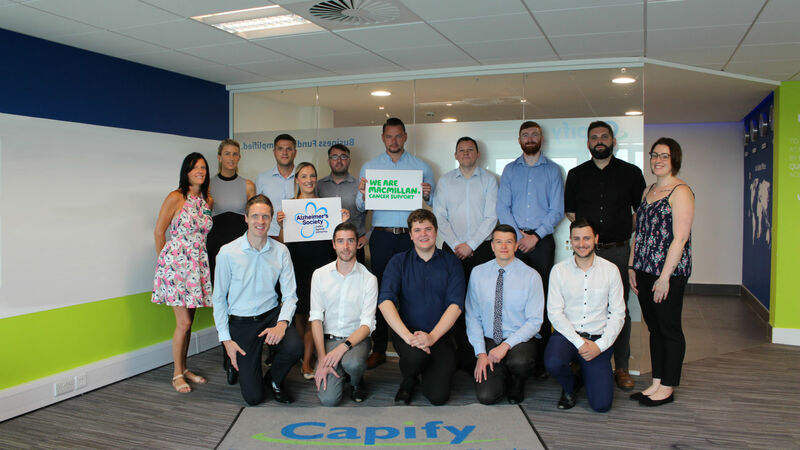 Two teams of Capify colleagues are warming up to run the Manchester Half Marathon later this year on 14th October. 16 staff members have signed up, dividing themselves into two teams supporting their own charities. Team Macmillan have raised £450 so far for Macmillan Cancer Support, who help people diagnosed with cancer, as well as their family and friends. Team Alzheimer’s Society have raised £360 for their charity, which provides dementia support and services across the UK. Team Macmillan have raised 18% of their goal, while Team Alzheimer’s Society have raised 14%, so they still have some fundraising left to do while they’re doing their training. The Alzheimer’s Society aims to be there for people affected by dementia. They conduct research into dementia causes and cures, run awareness campaigns, and maintain 3,000 local services across the UK. The money Capify raises will help them continue their work. Other members of the Capify team are expected to come and support their friends and colleagues on the day. The runners will be racing with people from all over the world, starting in Stretford, the race then does a loop around the city, and finishes at Old Trafford. There’ll even be bands, singers, and dancers performing at different points along the route, keeping runners entertained while they sweat. To support the teams and their charities, please donate to their Just Giving pages, and share on social media with the hashtag #capifycommunity.